The banana plantation Punta Finca del Lomo has been in the family for over 100 years. A couple of decades ago, the former houses of the workers were converted into holiday chalets. In 2013 Francisco, the owner and father of a family was in an accident and is now bound to an electric wheelchair. 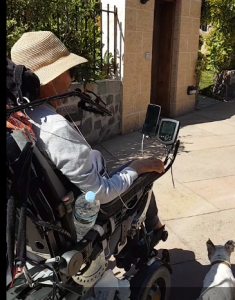 After extended rehabilitation he returned to Finca Punta del Lomo to live there and he decided to make the chalets fully wheelchair accessible. Since Francisco and his family understand what is needed for people with a disability you will find the houses well adapted and they offer free use of available mobility equipment (i.e.) hoist at the swimming pool, hospital bed, shower chair etc). The terrain is completely accessible with a wheelchair, including the banana plantation, where also excursions are offered. On the premises Fundación Step by Step opened a rehabilitation centre and visitors can also contract therapy sessions. The setting is an idyllic, tranquil oasis in the southern part of Tenerife, away from the mass tourism of the island. For both long term rehabilitation as for holiday stays, this accommodation offers a lovely retreat.